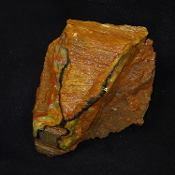 Fill a large flat rate box with assorted sizes and colors of rough AZ Petrified Wood. This item ships free anywhere in the continental USA. This rough piece of AZ Petrified Wood weighs over 37 Lbs. It measures 15 x 10 x 4 3/4 inches. First photo shown wet. This item ships free anywhere in the continental USA. This rough AZ Petrified Wood weighs just under 16 Lbs. It stands 6 inches tall and measures 7 1/4 x 6 1/8 inches. First photo shown wet. This item ships free anywhere in the continental USA. This rough AZ Petrified Wood weighs 23.5 Lbs. It measures 8 1/2 x 5 x 7 inches. First photo shown wet. This item ships free anywhere in the continental USA. This rough AZ Petrified Wood weighs over 11.5Lbs. It stands 4 1/2 inches tall and measures 10 x 4 1/2 inches across. First photo shown wet. This item ships free anywhere in the continental USA. This rough AZ Petrified Wood weighs over 8 Lbs. It stands 4 3/4 inches tall and measures 6 1/2 x 5 inches across. First photo shown wet. This item ships free anywhere in the continental USA. This rough AZ Petrified Wood weighs over 10 Lbs. It stands 5 inches tall and measures 8 1/4 x 5 1/2 inches across. First photo shown wet. This item ships free anywhere in the continental USA. This rough AZ Petrified Wood weighs over 3.5 Lbs. It stands 4 inches tall and measures 4 3/4 x 3 inches across. First photo shown wet. This item ships free anywhere in the continental USA. This rough AZ Petrified Wood weighs over 3 Lbs. It stands 3 inches tall and measures 5 1/2 x 3 inches across. First photo shown wet. This item ships free anywhere in the continental USA. This rough AZ Petrified Wood weighs over 11 Lbs. It measures 4 1/2 inches tall and 7 3/4 x 6 inches across. First photo shown wet. This item ships free anywhere in the continental USA. This rough AZ Petrified Wood weighs over 6 Lbs. It measures 9 inches tall and 4 x 3 1/2 inches across. First photo shown wet. This item ships free anywhere in the continental USA. This rough AZ Petrified Wood weighs over 14 Lbs. It measures 3 1/4 inches tall and 10 1/8 x 9 inches across. First photo shown wet. This item ships free anywhere in the continental USA. This rough AZ Petrified Wood weighs over 15 Lbs. It measures 8 inches tall and 9 x 5 inches across. First photo shown wet. This item ships free anywhere in the continental USA. These 2 rough AZ Petrified Wood pieces weigh over 3.5 Lbs. First photo shown wet. This item ships free anywhere in the continental USA. This rough AZ Petrified Wood weighs over 10 Lbs. It measures 6 1/2 inches tall and 7 x 3 1/2 inches across. First photo shown wet. This item ships free anywhere in the continental USA. This rough AZ Petrified Wood weighs over 6.5 Lbs. It measures 6 inches tall and 5 x 3 1/2 inches across. First photo shown wet. This item ships free anywhere in the continental USA. This rough AZ Petrified Wood weighs over 6.5 Lbs. It measures 5 1/2 inches tall and 9 x 3 inches across. First photo shown wet. This item ships free anywhere in the continental USA. This rough AZ Petrified Wood weighs over 4 Lbs. It measures 5 inches tall and 3 x 3 3/8 inches across. First photo shown wet. This item ships free anywhere in the continental USA. This rough AZ Petrified Wood weighs over 3.5 Lbs. It measures 4 1/8 inches tall and 5 x 3 inches across. First photo shown wet. This item ships free anywhere in the continental USA. This rough AZ Petrified Wood weighs over 8.5 Lbs. It measures 3 1/4 inches tall and 7 x 7 1/4 inches across. First photo shown wet. This item ships free anywhere in the continental USA. This rough AZ Petrified Wood weighs over 6 Lbs. It measures 5 inches tall and 5 x 5 inches across. First photo shown wet. This item ships free anywhere in the continental USA. This rough AZ Petrified Wood weighs over 6 Lbs. It measures 6 3/4 inches tall and 4 3/4 x 4 1/4 inches across. First photo shown wet. This item ships free anywhere in the continental USA. This rough AZ Petrified Wood weighs over 12.5 Lbs. It measures 6 inches tall and 6 1/2 x 5 3/8 inches across. First photo shown wet. This item ships free anywhere in the continental USA. This rough AZ Petrified Wood weighs over 6 Lbs. It measures 3 inches tall and 7 1/4 x 6 inches across. First photo shown wet. This item ships free anywhere in the continental USA. This rough AZ Petrified Wood weighs over 12.5 Lbs. It measures 4 3/8 inches tall and 9 3/4 x 3 3/4 inches across. First photo shown wet. This item ships free anywhere in the continental USA. This rough AZ Petrified Wood weighs over 10 Lbs. It measures 5 1/2 inches tall and 6 1/2 x 4 inches across. First photo shown wet. This item ships free anywhere in the continental USA. This rough AZ Petrified Wood weighs over 5.5 Lbs. It measures 2 inches tall and 9 x 5 inches across. First photo shown wet. This item ships free anywhere in the continental USA. This rough AZ Petrified Wood weighs over 4 Lbs. It measures 3 3/8 inches tall and 5 3/8 x 3 inches across. First photo shown wet. This item ships free anywhere in the continental USA. This rough AZ Petrified Wood weighs over 7 Lbs. It measures 4 1/2 inches tall and 6 x 5 1/4 inches across. First photo shown wet. This item ships free anywhere in the continental USA. This rough AZ Petrified Wood weighs over 3 Lbs. It measures 3 1/2 inches tall and 3 3/4 x 3 inches across. First photo shown wet. This item ships free anywhere in the continental USA. This rough AZ Petrified Wood weighs over 4.5 Lbs. It measures 3 inches tall and 7 x 3 3/4 inches across. First photo shown wet. This item ships free anywhere in the continental USA. This rough AZ Petrified Wood weighs over 6 Lbs. It measures 6 inches tall and 4 1/4 x 5 1/2 inches across. First photo shown wet. This item ships free anywhere in the continental USA. This rough AZ Petrified Wood weighs over 6.5 Lbs. It measures 4 inches tall and 6 3/8 x 5 1/4 inches across. First photo shown wet. This item ships free anywhere in the continental USA. This rough AZ Petrified Wood weighs over 4 Lbs. It measures 5 inches tall and 3 1/4 x 5 inches across. First photo shown wet. This item ships free anywhere in the continental USA. This rough AZ Petrified Wood weighs over 5.5 Lbs. It measures 2 1/4 inches tall and 8 1/2 x 5 3/4 inches across. First photo shown wet. This item ships free anywhere in the continental USA. This rough AZ Petrified Wood weighs over 5 Lbs. It measures 4 inches tall and 5 1/2 x 4 1/2 inches across. First photo shown wet. This item ships free anywhere in the continental USA. This rough AZ Petrified Wood weighs over 8.5 Lbs. It measures 5 inches tall and 7 1/4 x 4 1/4 inches across. First photo shown wet. This item ships free anywhere in the continental USA. This rough AZ Petrified Wood weighs over 7.5 Lbs. It measures 4 inches tall and 8 x 4 7/8 inches across. First photo shown wet. This item ships free anywhere in the continental USA. This rough AZ Petrified Wood weighs over 14 Lbs. It measures 8 1/4 inches tall and 7 x 5 1/2 inches across. First photo shown wet. This item ships free anywhere in the continental USA. This rough AZ Petrified Wood weighs over 2 Lbs. It measures 2 1/2 inches tall and 5 x 3 3/4 inches across. First photo shown wet. This item ships free anywhere in the continental USA. This rough AZ Petrified Wood weighs over 7.5 Lbs. It measures 5 inches tall and 6 1/4 x 3 1/4 inches across. First photo shown wet. This item ships free anywhere in the continental USA. This rough AZ Petrified Wood weighs over 7 Lbs. It measures 5 inches tall and 6 1/2 x 3 1/4 inches across. First photo shown wet. This item ships free anywhere in the continental USA. This rough AZ Petrified Wood weighs over 4.5 Lbs. It measures 4 1/2 inches tall and 5 1/2 x 3 inches across. First photo shown wet. This item ships free anywhere in the continental USA. This rough AZ Petrified Wood weighs over 10 Lbs. It measures 7 1/2 inches tall and 7 1/2 x 4 1/2 inches across. First photo shown wet. This item ships free anywhere in the continental USA. This rough AZ Petrified Wood weighs over 3.5 Lbs. It measures 3 1/2 inches tall and 8 1/4 x 3 1/2 inches across. First photo shown wet. This item ships free anywhere in the continental USA. This rough AZ Petrified Wood weighs over 7.5 Lbs. It measures 5 inches tall and 5 x 4 1/2 inches across. First photo shown wet. This item ships free anywhere in the continental USA. This rough AZ Petrified Wood weighs over 2.5 Lbs. It measures 3 1/4 inches tall and 4 7/8 x 2 3/4 inches across. First photo shown wet. This item ships free anywhere in the continental USA. This rough AZ Petrified Wood weighs over 2.5 Lbs. It measures 4 inches tall and 6 x 2 3/8 inches across. First photo shown wet. This item ships free anywhere in the continental USA. This rough AZ Petrified Wood weighs over 1.5 Lbs. It measures 1 1/4 inches tall and 6 x 4 inches across. First photo shown wet. This item ships free anywhere in the continental USA. These 3 pieces of rough AZ Petrified Wood weighs over 4 Lbs.First photo shown wet. This item ships free anywhere in the continental USA. These 3 pieces of rough AZ Petrified Wood weighs over 2.5 Lbs. First photo shown wet. This item ships free anywhere in the continental USA. This piece of rough AZ Petrified Wood weighs over 9 Lbs. It measures 5 x 5 1/2 x 4 1/4. First photo shown wet. This item ships free anywhere in the continental USA. This piece of rough AZ Petrified Wood weighs over 6.5 Lbs. It measures 2 1/4 x 8 x 5 3/4. First photo shown wet. This item ships free anywhere in the continental USA. This piece of rough AZ Petrified Wood weighs over 2 Lbs. It measures 3 x 3 7/8 x 3 3/8. First photo shown wet. This item ships free anywhere in the continental USA. This piece of rough AZ Petrified Wood weighs over 7 Lbs. It measures 5 x 7 1/4 x 5 1/2. First photo shown wet. This item ships free anywhere in the continental USA. This piece of rough AZ Petrified Wood weighs over 6 Lbs. It measures 3 x 5 1/2 x 5 1/2 inches. First photo shown wet. This item ships free anywhere in the continental USA. This piece of rough AZ Petrified Wood weighs over 5 Lbs. It measures 3 1/4 x 5 1/2 x 4 1/2 inches. First photo shown wet. This item ships free anywhere in the continental USA. This piece of rough AZ Petrified Wood weighs 10 Lbs. It measures 5 x 7 x 4 1/2 inches. First photo shown wet. This item ships free anywhere in the continental USA. These 5 pieces of rough AZ Petrified Wood weighs over 6 Lbs. First photo shown wet. This item ships free anywhere in the continental USA. These 4 piece of rough AZ Petrified Wood weighs over 6 Lbs. First photo shown wet. This item ships free anywhere in the continental USA. These 3 pieces of rough AZ Petrified Wood weigh over 4 Lbs. First photo shown wet. This item ships free anywhere in the continental USA.